I've recently run into a spot of bad luck when it comes to computers. First the power cord for my laptop dies. Soon after, the battery ran out of juice, and with no way to recharge it, the laptop was done. It survived 7 years of abuse, so it wasn't a huge loss. A week later my wife's computer began shutting itself off. Annoying, but still not completely unexpected. At 6 years old it had reached the end of its expected lifespan. I was hoping it would last one more month, so the timing was rather terrible. My computer was only 3 years old. It had no excuses. Turns out there's a bug in the motherboard that locks it up tight when you send it to sleep. Unrecoverable. 3 computers in as many weeks, and we were suddenly living in the 80's. We picked up a fancy new Dell for only $600. From a raw power per dollar standpoint, no one is even trying to compete with Dell. It was a thousand bucks cheaper than the closest comparison. I ordered a $60 motherboard for my computer. I haven't installed a motherboard since 1999, so anxiety was a bit high as I played operation on one of modern life's necessary components. Luckily, everything went smoothly, and the office had a computer again. I set this machine up on my wife's desk, and placed her broken machine in the corner for later analysis. I then ordered a new gaming machine for me: liquid cooling, 12 gigs of ram, and a processor 5 times faster than my last computer. That's a bit faster than Moore's law. The new computer runs amazingly, everything pops. I ran 3Dmark to rank it in the journals of history, and a long beep came ominously from the box. I killed the benchmark fearing the worst, that I'd overheated my CPU and melted my new box to slag. To my relief, it was fine. Nothing appeared to be broken, so I ran the benchmark. Again the beep, and again I canceled the benchmark. I rummaged around in the CD's they'd sent me and came up with the motherboard disc. Modern motherboards are covered in sensors to tell you all about what is going on in hard, merciless numbers. My CPU was peaking at 60 degrees celsius during the most brutal benchmark test. That's a full 35 degrees BELOW the danger zone. Clearly the liquid cooling was the correct purchase. That means the trouble is in the GPU. Unfortunatly, nVidia does not supply an easy way to monitor your GPU tempurature, so I had to pull down the third party app, Afterburner. It has some really neat histograms on temperature, fan speed, and memory usage. My GPU was climbing all the way up to 80 degrees celsius during the graphics benchmark. Lucky for me the GTX 470 is rated up to 105 degrees. With my heat worries alleviated, I decided to let the benchmark complete. It wasn't going to melt to slag, so maybe something else would shake out. Half way through the test, the machine powered completely off. I stared at my beautiful dead computer, and realized it was still beeping. Why was it beeping without power? I pulled the case off and stuck my head inside. The beeping was not coming from my computer. The beeping was coming from my battery back up. The new machine pulled too much juice at its peek performance for the backup to handle. I plugged the computer directly into the wall, and it wasted the 3Dmark11 Pro benchmark with a score of 4300. All is right again at the homestead, or will be when the new lamp for our TV arrives. This is a neat infographic with some useful tips on making your life easier and more organized. 1. I don't reverse the hangers. Instead I always put clean clothes on the left and choose clothes to wear from the right. The shirts on the far right at the end of the season are sent to goodwill. 3. The movie Vengeance demonstrates this with a thin cord over the top of the door instead of a rubber band. This is why hotels use the solid metal hoops instead of the chains. Of course, a kid's suction cup arrow will defeat those. 4. Eating a banana 'upside down' is not all that great. There is a black nub on that side you don't want to eat, and that nub also serves to keep the banana in the peel for the last bite. If you follow their advice you end up eating the nub and the banana falls out of peel towards the end. 1. This is awesome. Basically a weeks vacation in the company's bathroom. What more could you want? Make sure you save the world with that time. 2. This is something I really want to try. I hear staying awake for 24 hours will also reset your clock. 4. Super, but have you ever tried to open a coconut? It's next to impossible without a machete. 7. This never works for me. 8. Putting new pillow cases on and rotating towels sounds like a lot of work, but if it is effective, then it'll be worth it. 1. This was discovered by Earl in the Best Buy parking lot in the 90's. He could unlock his car from forever away. 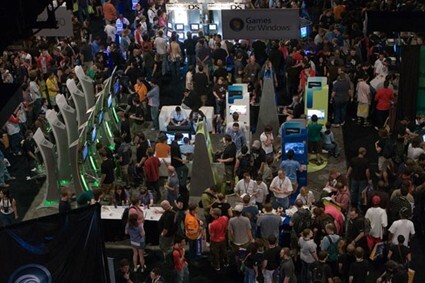 We had an amazing time at PAX this year, and there are plans in the works to hit PAX: East in Boston around 2013. However, next time I’d like to play it a little different. Use the lessons learned etc. The last one there is the dark horse. I spend a lot of my time reading about and playing video games, so when we walked through the convention hall, I’d seen most of the big players before. I knew which games I would buy, and which games I would pass on. I pretty much knew what to expect from that hall floor. 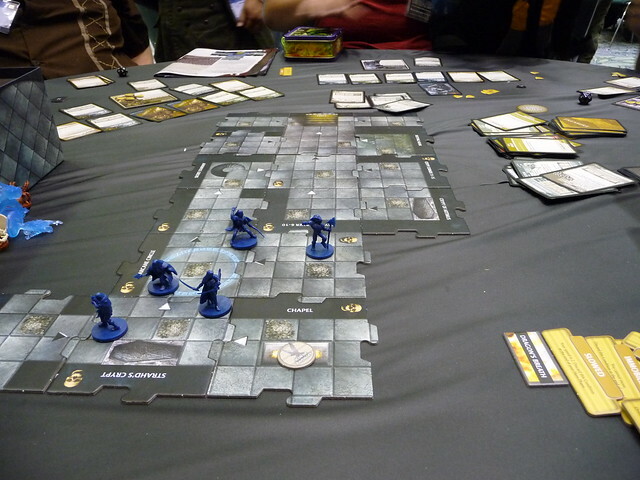 What surprised me is how much fun I had playing Castle Ravenloft in one of the side halls. It's actually a cooperative board game. You aren't competing with your fellow gamers, but working together to defeat the challenges of the game itself. After reading GeekDad’s post on PAX, I lamented missing so many new and interesting board games that I could have tried out. Oh, and next time, we’re doing the delve. We almost skipped what turned out to be the highlight of PAX. The PA kids have an ongoing D&D game with Wizards of the Coast that was originally designed to show off the new 4E system. Their podcast of the game has proven to be so popular that they have continued their adventures sporadically throughout the years. 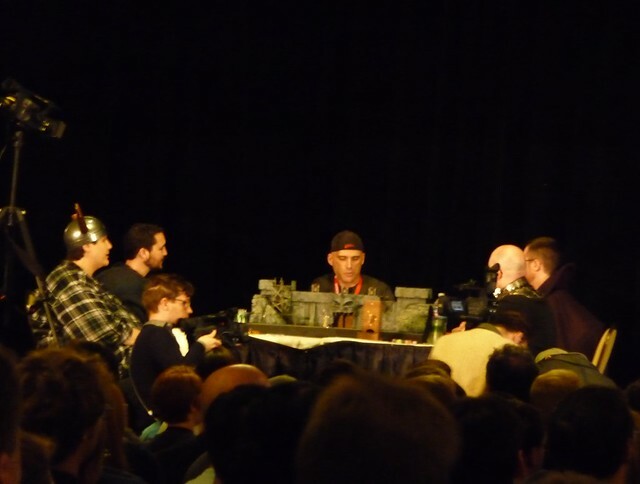 This was the first PAX where the event took place in front of a live studio audience i.e. us. The show was Saturday afternoon, so by then we had thoroughly learned the two major lessons of ‘Go to everything that the PA kids are involved in’ and ‘Go early because the line will be epic’. We arrived almost 2 hours early to take our place pretty close to the front of the line, which quickly filled out behind us with a thousand people. The game itself is hard to describe. It was a combination of stand up comedy, D&D, good friends, and a ton of inside jokes. Kurtz and Krahulik are in rare form for the entire adventure. If you’re steeped in the geek culture at all, you owe it to yourself to watch this 2 and a half hour game. After the show, we were slow to leave because we wanted to get a closer look at the table they were using. Everyone filed out, except for a handful of us, and the PA kids. I happened to have a first edition PA book in my bag on the off chance an autograph opportunity arose. It arose. I scored signatures from both Mike and Jerry, and I'm now the proud owner of a piece of internet history. We did actually make it to some talks about game design and story telling. There were some very key lessons learned during these few hours. As I said before, lines form early to everything at PAX, so plan accordingly. However these lines are different than what you find at Six Flags or Disney Land. We joined the queue about halfway back, and were immediately embroiled in a game of Apples to Apples or a discussion of Plants vs Zombies. In one line a spontaneous multi-round 'face off' occurred where the participants attempted to come up with the most creative dirty look. It was co-op too, so you were judged on how well your face warping worked with your partner's. Once inside the theater, a harsh truth is realized. The panel's fun factor is 100% dependent on the panel leader's experience. Our first group had a couple of crazy indie developers who's games no one at PAX had played. If no one at PAX knows about your game, it might as well not exist. Luckily, there was one lady who had worked on Assassin's Creed and Guild Wars. She had interesting comments to make, which were put into context because we'd played those games. So remember the lesson, the session name is little more than an advertisement. Make sure more than one speaker has experiences you care about. After the session, the floor was opened up to questions. This brings up another excellent lesson. Vary your panel topics from day to day, because the questions for story telling and pen & paper RPGs are exactly the same. We got to spend a lot of time on the convention floor on Friday, hours in fact, and we still didn't see it all. We were still discovering new nooks and crannies on Sunday. Ultimately I think the best strategy for taking it all in is to avoid lines. Generally speaking the lines formed in front of the AAA titles. These are the same titles with huge marketing departments, so you are bound to already know a lot about the game. In fact, we generally knew which games we were going to buy and which we were going to skip. Don't spend time on games you know you're going to buy! All you're doing is exposing yourself to spoilers, seeing early development bugs, or making yourself pine for a game not due out for 6 months. None of that is good! Look at the both setup itself! Talk to developers about where the game is going, but don't wait in a line for 5 minutes of gameplay. It'll take you that long to figure out how to invert the mouse. It was a lot more fun to talk to some of the indie game developers, and play games like Drumskullz and End of Nations. The draw of the AAA titles was clearly the booth itself. 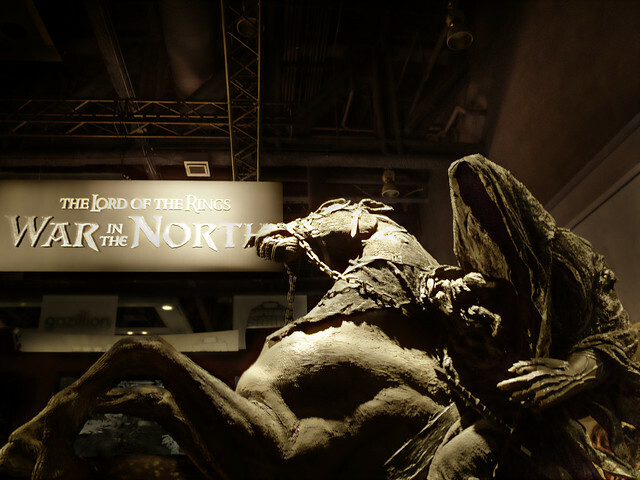 I mean, they had a TRON light cycle and a Nazgul. What more could you want? One booth caught our attention because there didn't seem to be an entrance. In fact the whole thing seemed designed to prevent us from seeing what in the hell FireFall was. After circling around we found the front where they were signing people up for their newsletter campaign. This is exactly what we don't want. We want to see the game itself. Slipping by the front lackeys we found a sequestered booth were some guy was playing the game. He was explaining the action to two other guys, so we stepped up to listen. We liked what we heard, so we started asking questions, a lot of questions. In fact, the guy was suddenly giving us a demo instead of the original visitors. We were just getting excited about the game when we were interrupted by one of the lackeys from the front. It turns out this was FireFall's exclusive launch, and we had just crashed a press event. But we got what we wanted! And it turned out to be an exclusive! We left the main stage in search of food. This was the first true failing of PAX. What do you do for lunch? You would guess that feeding 70k would be a priority in the planning of such and event, but you would be wrong. PAX relies almost 100% on downtown Seattle's supplied eateries. There's a small concession stand on the second floor, but I dare not call it food. We were forced to survive on Subway, Chipotle, and Jimmie Johns for lunch. It wasn't until Saturday night that we found a great local bar/flatbread place to dine. Yes, we walked all over downtown, and yes, we had the power of the internet in our hands, but none of that really helped us fine 'the' place to eat lunch downtown. The swag failure wasn't limited to kids. Sure you could jump through hoops to get some crappy free T-Shirts but nothing especially clever. Even the Penny Arcade merchandising booth was seriously limited. I can't help but think this has to do with them reorganizing their store, but they weren't carrying any of their best shirts. In the interest of full disclosure, both Tom and I got suckered into their book + shirt sale, but we were dying to buy something!